Daisy the Curly Cat: Happy New Year! Hooray, it is New Year's Eve! To celebrate, I am wearing this very formal suit. I love the flouncy ruffles and sparkly sequins - they make me feel festive! Oops, I almost forgot to wear my jewels! I think pearls are a good choice. Now I am ready for New Year's Eve. I think I will watch some cartoons and drink some sparkling water. This is going to be a wild night! Goodbye, 2010! I hope 2011 will be the best year, ever. Happy New Year to you my dear friend Daisy~! You are so beautiful today~! May the best wishes to you for always. 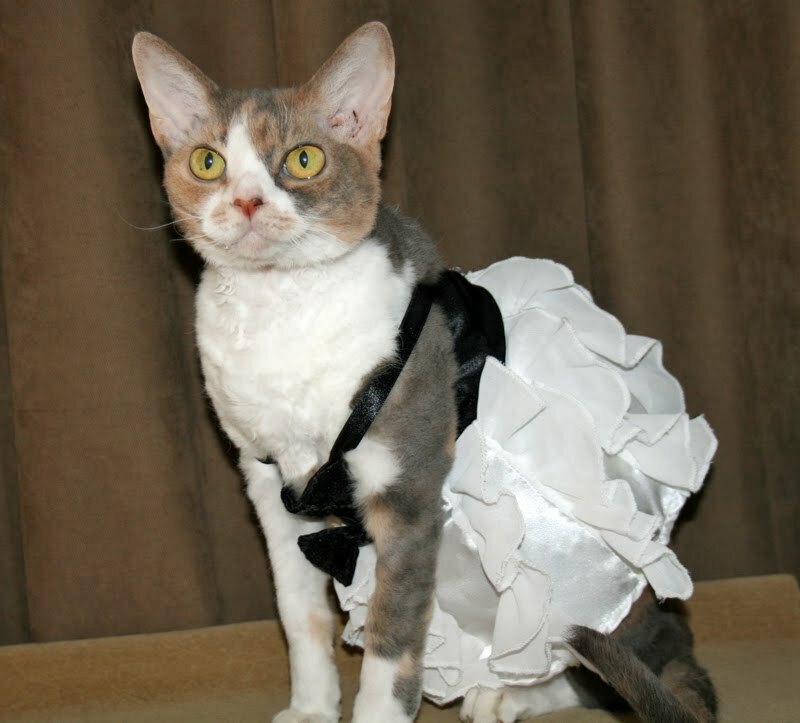 You look so elegant in your pretty dress, Miss Daisy. Happy New Year to you and Harley. Happy New Year, Daisy, Harley, and family! We look forward to another year of fun, laughs, and learning when we visit your blog. You're ready for Milo and Alfie's party now, Daisy! We wish you all a very happy new year, and may 2011 bring an abundance of good health, laughter, joy, and love! Mom says she wishes she looked like good tonight! :D Happy new year daisy and harley too! Oh Daisy that is a fancy dress and a very pretty one. Love the last picture. Behave yourself tonight but have a very Happy New Year to you and all of your family. Happy new year to you Daisy, and to Harley and your mommeh and daddeh too! Thank you for your good wishes, Daisy! You are looking gorgeous in your beautiful, festive outfit! happy new year miss daisy and thanks for all the smiles. You look beautiful!! The pearls really make the outfit! Mom says 2011 is going to be a great year for effurybuddy! Daisy, you are ready to party in that outfit!! Happy New Year to you, Harley and your family! Hi Daisy! Thank you and Harley for bringing me so many smiles in 2010! I have to say that I love your outfit..it's go glamorous! You look like you came straight out of the United Bamboo Cat Fashion calendar! I wish you and your family a very happy and healthy 2011! Daisy, what a beautiful outfit on a beautiful girl! Happy New Year, Daisy, Harley and Mommy and Daddy! you look beautiful daisy! happy new year to you and harley and mommeh and daddy too! You look beautiful, pearls are the perfect. You know Harry is all dressed up too in a black tux dinner jacket. You two would look might cute together. I htink he would like to take you out tonight. A very HAppy New Year to you and your family. Daisy, you are a beautiful party girl. Happy new year to you, Harley and your Mommeh and Daddy. Wishing you all good things in 2011. Happy New Year!!! Happy New Year Daisy, Harley, Mommeh, and Daddeh! Daisy, you look lovely! Happy New Year! You look so elegant, Daisy! You are definitely ready for tonight's festivities! Happy New Year! That's the perfect outfit to bring in the new year. Don't party too hard tonite. We wish your Mom and Dad, you and Harley a very Happy New Year. We must say Daisy we think you will be the best dressed lady on the CB tonight. You look spectacular! Are you going to have some nip too? happy new year, miss daisy!!! we fanks you fur alla the fun an' laffs you has giffen us! we wishes you an' harley an' mommeh an' daddeh bountiful health, comfortable wealth, an' more luff than you already haff fur each ofur--an' the time to enjoy them together!! Happy New Year Daisy! Your outfit is simply elegant and you look fantastic! You look just beautiful, Daisy. 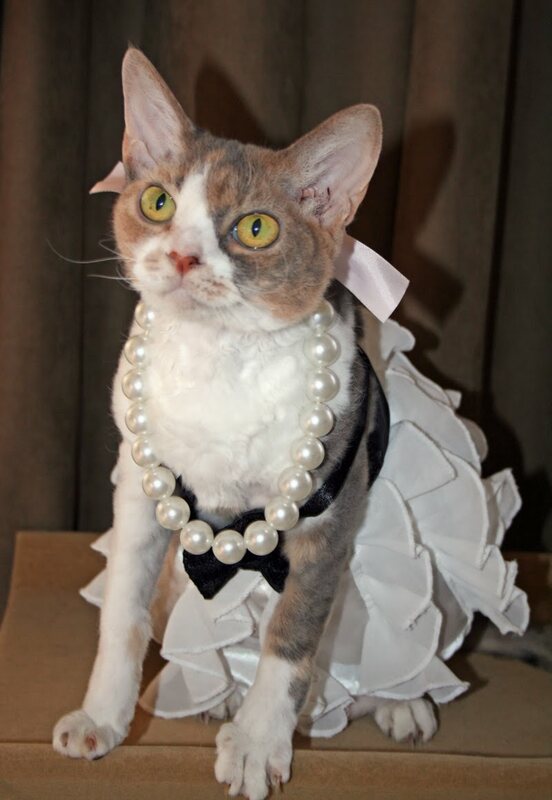 And we do agree...pearls are the right accessory for that dress. 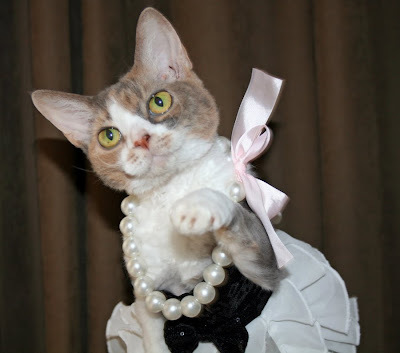 You look lovely in your New Years outfit Daisy, and the pearls set it off perfectly. Happy New Year to you and Harley, and to your mum and dad. Purry Happy Mew Years to woo! I'm sure woo will get lots of khysses when the ball drops! Daisy - you look gorgeous. Enjoy yourself this evening and Happy New Year. You look beautiful, Miss Daisy! Happy Mew Year to you, too! Daisy you are such an elegant little lady in that beautiful outfit of yours. We wish you, Harley and your Mommy a wonderful 2011, full of peace, love, health, and prosperity. Thanks for making us smile with your fantastic blog. Happy New Year from Clooney, Neytiri and our Mom. Daisy, you are absolutely stunning today! Happy New Year to you, Harley and your mommeh and daddeh! How gorgeous you look in your black and white outfit...and pearls are so fitting for you. Oh, Daisy, you look so fancy shmancy! The pearls really make the outfit (along with your pretty smile). Hey, guess what? Remember I told you I live near the Just Born company? They make Peeps and tonight they will do a Peep Drop to ring in the new year downtown. Daisy, it's a GIANT Peep, so big it would crush you! I will videotape it for you on account of I know you loves your peeps. If it comes out GOOD, I will put it on my blog for you to see, OK? hey! I did not gets clothes for new years. No fair!! Happy new year to you and Harley and to your peoples too. Daisy, you look so dainty and feminine and absolutely breathtaking in that suit, You are more stunning than I have EVER seen you. I love those ruffles and flouncy skirts on you and those pearls..oh MY! You are gorgeous. NIKITA: OK, we came over from looking at the outdoor furniture, are you happy now? ELVIRA: Oh, yes! Such pretty clothes, & whatever that is around her neck! NIKITA: A String of Pearls. Can we change the link we got to Daisy to one with the cool Badge of her in the hat? Please??? Daisy, You look wonderful. Have a good time. You are very festive! And showing just the right amount of cleavage. Have wondeful New Year and hope for grand 2011. Hi! We just started our own blog, and we're going around trying to meet other bloggy pets. You look so pretty in that dress! We hope you have a great New Year! Daisy my dear you look devine. Where is Harley? Is he picking out a lampshade to wear at that wild and crazy party you are having? Best Dressed as always Daisy! Sparkling water AND cartoons? Daisy, you are a party ANIMAL! Here's to a healthy and happy 2011.
you look Purrfectly pretty Daisy! Is Harley in black tie to dance with you? Have a wonderful Mew Year! Daisy, here's wishing you and Harley and your human staff a happy 2011 with lots of good things, from all of us Good Cats (and our human staff too)! Simply stunning as usual Daisy! Your outfit is purrfect for your furs. 2011 will be the bestest year ever! You and Harley and yur fambly are loved! Life is great! Happy New Year! Happy New Year's Eve Daisy, Harley and your Mom & Dad!! We just love your outfit Daisy!! It is puuuurfect for New Years Eve!! Have a Blessed & Prosperous 2011!! Happy New Year to you too Daisy, Harley and Mommeh and Daddeh too! May 2011 indeed BE the bestest ever! We hope 2011 will be a great year for you and your family, Daisy. Daisy, you are looking especially beautiful today. Happy New Year to you, Harley, your momma and daddy. Happy New Year Daisy, Harley, Mom and Dad! Daisy you look lovely!! We wish you & your family a very Happy New Year!! Happy New Year to you and Harley ..and of course, to the best Mommeh in the world! ... She who kisses your lips with Porcelain PInk. Miss Daisy, cartoons and sparkling water sound way more exciting than my mom's NYE! Happy New Year!! Was the night as wild as expected? Happy New Year! Have a wonderful 2011.
mi mom sez yer rite in stile. she sed dat da look iz gointa be tutuz an stuff dis yeer becuz uv da black swan. happee noo yeer to u an harley an frum mi mom to yer grate mom an dad. Happy New Year Daisy, Harley and family! You look so precious with your little hand up! This is a pretty dress. You looks very beautiful, Daisy ! Happy New Year, Daisy! 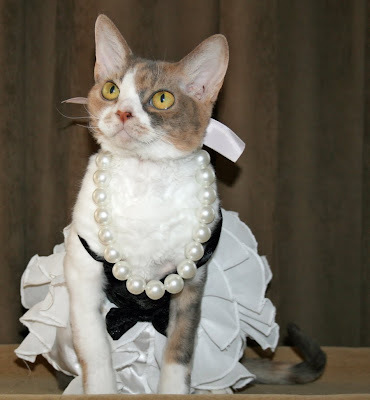 You look very elegant in your dress and pearl neclace. I wish you a very happy, joyous 2011!! Happy New Year!! The pearls definitely look good on you! oooohhhh Daisy yur lofly thar. We hope yoo and Harley hafe a Happy New Year. Happy New Year, Daisy and Harley! That is a lovely party dress! You are such a pretty girl, Daisy! We loves your jewels too. Happy New Years, sweet girl. Happy New Year, Daisy! :) Many happy returns. That is VERY FORMAL Daisy! And lovely! Happy New Year and a Wunnerful 2011 to you. Happy New Year, Daisy!! You look so fancy and festive. Sending hugs to you and your family! Flouncy and fabulous! Happy New Year to you and Harley and your Mommeh! You look festive! Happy New Year! Thats a great dress Daisy! I like your pearls!! Hope you have had a great 2010 and enjoy 2011 to the full! Oh Daisy, you are beautiful! Sounds like you had a great time!